The District Officers, under the supervision of the Kiwanis Committee on Circle K, lead the Alabama District of Circle K International. District Officers have numerous responsibilities and must be willing to fulfill the obligations of the office completely and on time for the District to run smoothly. Their efforts are truly the success or failure of the organization. Throughout the storied history of Circle K in Alabama, the Alabama District has been blessed to have many outstanding and dedicated leaders, and I have complete faith that will continue far into the future. Nevertheless, each candidate must sign a Service Agreement (located at the right) detailing the duties of their office prior to their nomination being accepted and certified by the Elections Committee. Additionally, there are numerous rules and guidelines for campaigning that have been put in place to ensure that all candidates have a rewarding and meaningful experience, free of hazing and bad-faith, while ensuring that the integrity of the election process is not comprised. These guidelines ensure that elections in the Alabama District Circle K are fair, honest and in the best interest of everyone involved. These rules will be reviewed with each candidate in the Candidate’s Meeting on Friday of Convention. Prior to that meeting, one important thing to keep in mind is that all candidates for District Office or International Office Endorsement must be endorsed by their home club. Lt. Governors are elected primarily at their respective Division Caucuses by the Clubs of the Division they will represent. However, at a time designated in the Convention Program, any still vacant divisions will be elected at District Convention by all delegates attending. Running for District-Wide Office, like Governor, Secretary/Treasurer or Communications Officer, involves more time and commitment of service. Formal nominations will be made from the floor of the District Convention sessions as noted in the convention program. 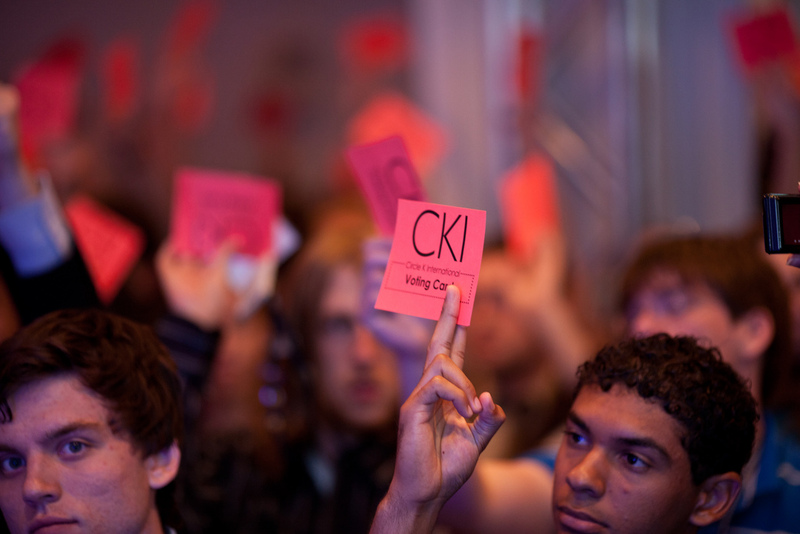 Candidates should be ready to address the General Session, go before Circle Kers in Division Caucuses, and represent their Home Club and Circle K throughout the convention. Candidates will be scheduled to visit the House of Delegates for a final speech and then the election will take place with two delegates from each club and any delegates-at-large voting. The winners will be installed at the Governor’s Farewell Banquet. Candidates may also run for Endorsement for International Office. Those offices are Circle K International Trustee, Circle K International Vice-President, and Circle K International President. These candidates will follow the same procedures as those for District-Wide Office. All those considering running for any office should study the obligations linked at right and be aware of the responsibilities of the office. As part of those office requirements, if elected, attendance is required at the six District Board Meetings each year. Each candidate is allowed to submit a pdf file that is two 8.5x11 pages. This allows each candidate to tell the district more about themselves and their policies. The files will be put on the convention app for all participants to view. Candidates are also allowed to bring one poster to be displayed at the registration throughout convention. If the candidate chooses to bring a poster, they must also provide an easel. Posters cannot be affixed to the walls, furniture, etc. 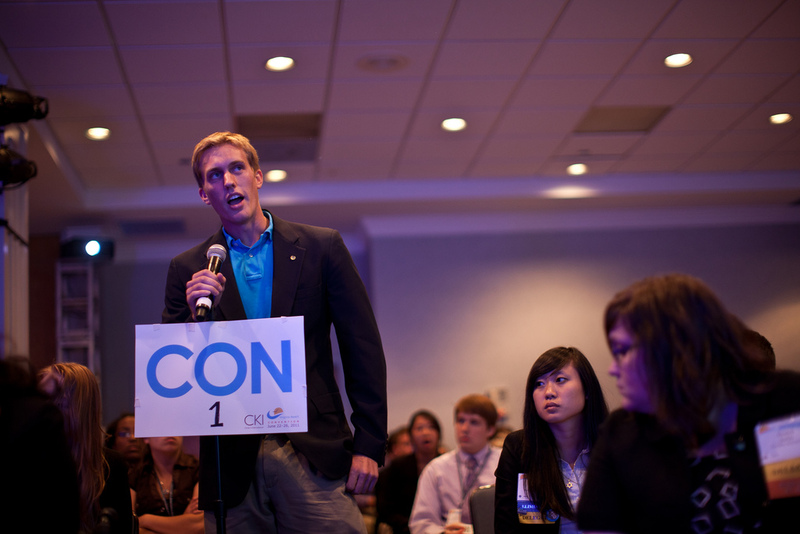 During convention candidates will have several opportunities to present their platform. Friday Night Welcome Session: Each candidate will have 3 minutes for an introductory speech. Saturday Afternoon Division Caucuses: Each candidate will have 7 minutes to speak. This includes any introductions, prepared remarks, and questions. Statewide candidates and those seeking endorsement for international office will speak in each caucus room. Lt. Governor candidates will only speak in their division’s caucus room. Saturday Night House of Delegates: Governor candidates will have 3 minutes to speak. All other statewide candidates and those seeking endorsement for international office will have 2 minutes. Lt. Governor elections will take place during the division caucuses. Only candidates seeking unfilled Lt. Governor positions will speak during House of Delegates.